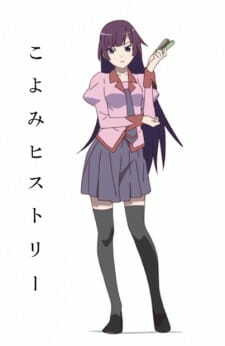 Koyomi History is an animated adptation of the homonym side story published in the Madogatari Exhibition pamphlet, written by Nishio Ishin (Also known as NISIOISIN), the Monogatari Series author, and it talks about Koyomi Araragi remembering the girls he tried to help. This special "episode" is represented on a white background, it has no sounds (except for the characters voices)(this is why i have not rated the sound) and we can see all the main Bakemonogatari characters, with Koyomi as protagonist. Also Koyomi History is placed (by the reading order) after Orokamonogatari, in the Off Season of the novel that doesn't have an anime adaptation yet. I think this episode doesn't deserve a 7 as overall rating, but I personally enjoyed to watch this side story animated (I'm a huge Monogatari Series fan, that's why) even if the art is not this good (really minimal and doesn't literally add anything very important to the episode) and there is no background sounds. I might as well write a review for this as the vast majority of people don't seem to be able to understand what this short is trying to do. In my humble opinion, this is a masterpiece as it perfectly encapsulates the feelings of my experience watching Monogatari. Since this is less than 4 minutes long, it's obvious that they have to be economical with there time. Therefore the story is simple: it's just Araragi reminiscing about the five main girls of the series and that's all it needs to be. Some may claim that there should have been 'more' somehow but, i think you're judging it by the wrong standards. I think it's best to judge it like a piece of music, with the dialogue being the lyrics. The best stories and, by extension, music conveys the emotions that the writer was feeling while writing - lets you experience those emotions. Koyomi History does exactly that. It puts me in the frame of mind to reminisce on the time I've spent watching these characters struggle, grow, laugh, love and hate. With very few words it conveys the accumulative emotion of the entire series for me. Now, sure, there's very little animation and no backgrounds but, does there need to be? I think not. By keeping the visuals minimal - a vast departure from the usual style - it allows you to concentrate fully on the characters, assisting that reminiscence. Araragi not even being shown in the short also helps keep this focus - it's not about his experience. Again, just because the only sound is the voice acting doesn't mean that it's bad. I'm probably getting repetitive but, it's all in service of creating the best atmosphere to reflect there's nothing but the characters. It's Monogatari, so yes the characters are great and they all get to show what makes them great. This stimulates that contemplative mood. Some may argue that it doesn't offer anything 'new' and to that, I'd say it's called Koyomi HISTORY for a reason. As you can probably tell, I enjoyed it. It allowed me to experience some of my fondest memories again and somehow gave me lots to think about despite hardly saying anything at all. This is a masterpiece as it delivers the emotional impact of an entire series in less than four minutes. However, this is only for people who love Monogatari and it's characters. Now, about the art, it's very good, like the normal episodes, but they're in a white space, with nothing more, only the characters, and Koyomi don't appears, only what he said written on the white screen; the episode don't have any music or anything else, only their voices. It was a light, yet fine special episode from the Monogatari project, the question is, why would you make it as a separated special instead of adding it to one of Owari after-credit episodes? I mentioned Owari specifically cause it suits the atmosphere of these 3 minutes. Not only the atmosphere, I saw this special real timing comes after Owari end. It's all about how .. after period of life time, will Araragi Koyomi remember each one of the girls? Cute hint of how well the relationship between him and Senjougahara goes on as he still discovers new versions of her day by day. Good arrangement of the girls as it goes from the closest one to him to the ones that destined to get far paths, his gf at first, his ghost companion next who is still very close to him, the good friend that keeps seeing a Senpai in him -we already knew from Hanamonogatari that she still meet him and talk like they were when he was still a high school student-, then Nadeko, in prior of Hanekawa just because of the little blood on his shoulder towards her and Senjou thorugh the snake event, Hanekawa comes late, she is still far and her story is settled so nothing really bothering in his memory about her. And finally we got the only person didn't need to talk in the episode, he can feel what she can say simply with no talking, she came last not because she has the least bond, she came last because she will never be a memory.. after all, she is his vampire side. The special was really decent and refreshing, managed to give me a beautiful memory of the sweet suffering I felt while watching Monogatari, I am still a little bit not satisfied about its date of release and being separated, but I am glad I watched it.